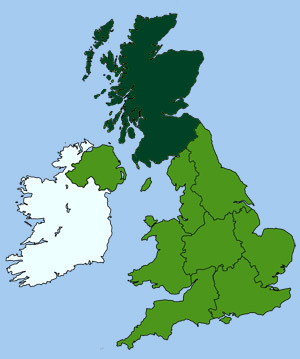 West Scotland contains the counties of Argyll & Bute, Ayrshire, Dunbartonshire, Inverclyde, North and South Lanarkshire and Renfrewshire. Loch Lomond (shown above) is the longest stretch of inland water in Britain, at 23 miles in length. It runs through the counties of Stirling, Argyll & Bute and West Dunbartonshire, and is part of a National Park that covers a vast expanse of mountain scenery, waterways and forested countryside. Argyll and Bute is Scotland's second largest county, covering over 2600 sq miles. Despite its size the population is very sparse, although it does attract around 2 million visitors every year. It has some of the most wild and magnificent coastline found anywhere in the UK, which is characterised by its fjord like sea lochs, hills, mountains and scattering of offshore islands. It is difficult to believe today that this remote, yet dramatic landscape, once experienced hundreds of years of civil unrest. Argyll & Bute: Campbeltown, Dunoon, Inveraray, Lochgilphead, Oban, Tobermory. Ayrshire: Ayr, Cumnock, Irvine, Kilmarnock, Kilwinning, Largs, Saltcoats, Troon. Dunbartonshire: Alexandria, Clydebank, Cumbernauld, Dumbarton, Helensburgh, Kirkintilloch. Inverclyde: Gourock, Greenock, Inverkip, Kilmacolm. North and South Lanarkshire: Glasgow, Lanark. Renfrewshire: Barrhead, Greenock, Johnstone, Kilmalcolm, Paisley, Renfrew.